New photo added 5-26-2012. A few years ago a friend brought a version of this salsa to a picnic we both attended and it was an instant hit, with absolutely none left over. I've changed it a little, of course, and for one thing I added the tomatoes. When you can get in season fresh tomatoes this salsa can't be topped! It is so fresh and vibrant and popping with flavor and color! I can't wait for the tomatoes in my garden to grow so I can make lots of this tangy salsa. I do use canned black beans, drained and rinsed really well, but you could certainly cook your own if desired. Fresh corn is the best also, but canned does work and so does left over grilled corn. In fact, the grilled or roasted corn is really yummy in this dish. Top it off with fresh peppers and onions and some lime juice and you've got an instant hit at any gathering. Let's make some now. Actually, the avocado doesn't keep well if you have any left over the next day, but you can always pick it out. This is a taste of summer on a chip, but I couldn't wait for summer to get here to make it and share it with you. Enjoy! What's your favorite summer salsa? Lynda, this is just beautiful. It's also very healthy and that makes for a great combination. This looks so fresh and tasty! Perfect with all the summer veggies! I know I LOVE this. I'm such a magpie -- I am attracted to the bright colors. I can taste and smell how good your recipe is! Wonderful blend of fresh veggies and flavors. YUMMERS! I had to laugh at your post. I made mango salsa today and added cilantro to my "half" because DH has the anti-cilantro gene. I added red onion, jalapeno, and a little rice wine vinegar to the mango salsa. Mmm, good! 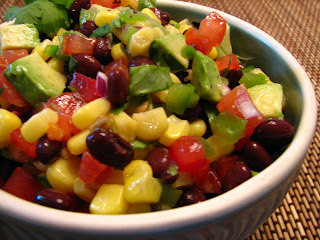 I love black beans in salsa... will have to make some of this. I could eat chips and salsa every day! What a nice addition to any get together! I bet it would be gone in moments! I could live on this stuff! I love salsas like this - it looks delicious and colorful. Maria, I used a different brand of black beans this time and they do have a slight red cast, which really showed up in my poor lighting for this picture! They are not kidney beans , however. It's mostly the lighting, as we've had dark stormy weather lately which has affected my photos.We need some sun! I make a similar recipe - so good and so easy! Plus it's good on almost everything. That is my kind of salsa!! I love black beans in my salsa. If I get store bought, I always had a can of black beans. Looks yummy and fresh! This looks fabulous Lynda, so colorful, and I love all the flavors. So fresh and delicious. I love eating/making this, especially around this time of the year, it's perfect warm-weather food :).